According to them you’ll be able to make a whopping $1,200 per day but I think you’ll agree it all sounds a bit suspicious, so what’s the deal here – is it actually legit or is Duty Money a scam? What Exactly Is Duty Money? 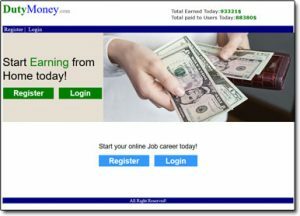 Duty Money is a website that poses as a legitimate Get-Paid-To site – this is a type of website that will pay you in return for completing short tasks online. Typically though since the tasks are so easy most Get-Paid-To websites only pay out very small amounts, in fact on average the likelihood is that you’ll usually earn less than a dollar per task completed. This is where Duty Money claims to be different, because instead of only paying out little amounts they claim to pay out large amounts. According to their website you can make up to $1,200 per day with their program & they’ll even credit your account with $25 just for signing up. But honestly this is just totally unheard of throughout the GPT industry so it’s a massive red flag. There is no way a company like this would ever need to pay so much money because as I said the tasks are super easy which means there’ll be a long line of people ready to do them for less money. How Does Duty Money Work? Okay so the truth is Duty Money doesn’t work as promised, there is no way that you are going to make money through this site – at least not money that you will actually be able to withdraw anyway. The reason I know that is because Duty Money is actually just a re-hashed version of a scam that I’ve previously exposed before on this blog named Dollar Tell & this is a very dangerous scam indeed. The reason I say that this is a dangerous scam is because this one isn’t out to just steal your money, it’s out to steal your details to then steal your money… And on top of that they’re trying to use you to help them steal other peoples details! Basically all of the promises made by Duty Money (and the other sites like it such as Dollar Tell) are totally fake. 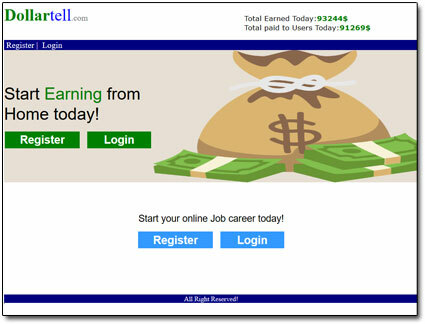 They just want to make it seem like you can earn lot’s of money quickly & easily through their site so that you’ll sign up… That’s why they even claim to offer a $25 bonus just for creating an account. The truth is all they want is your details. When you sign up you’ll be asked to enter your email, a username & password… They are merely hoping that you enter the same details that you use for other sites so that they can get access to your accounts. For example if you have an Amazon account with the same details they will try & get access to it & if they do they will start ordering things. That’s just an example but they will try anything that is linked to your details. Anyway, here’s the worst part… They are actually trying to get you involved in the scam, and sadly I’ve seen that it’s working because many people do not realize the whole thing is a phony. You see after creating an account (which I obviously don’t recommend you do) they claim they will pay you $10 for every person that you can get to click a link. Apparently this is their “advertisers” link, but it’s not – because if you click it yourself you’ll see that it just takes you to a site named Task Stipend which is just another duplicate of the Duty Money site. Basically they’re just getting you to get people to sign up to their scam, and they make it seem like they are paying you money to do so. It’s quite convincing too because if you get people to click the link then the money in your account will appear to go up by $10 each time, but the problem here is that they set a $300 withdrawal limit & when you try to request a withdrawal that’s when you’ll realize it’s a scam. They are not paying anybody… It’s all fake. I know that since the Duty Money site allegedly provides an easy way to make money you might not be wanting to just take my word for it, so for that reason I want to point out a few red-flags so that you can see for yourself it’s a scam. Firstly this site is an exact replica of Dollar Tell which as I mentioned above was a similar scam I previously exposed & if you look for reviews on that you will see they all back up what I said about it. Task Stipend the so-called “advertisers” site is also another exact replica. In the top right hand corner of their website they have a counter which allegedly shows the “Total Earned Today”. If you refresh the page you will see that this is completely random & sometimes it even goes down to a lower amount… A clear sign that it’s fake. The withdrawal limit is set at $300 which is extremely high – I have never, ever seen a legitimate site with such a high withdrawal limit. Usually you can withdraw as soon as you have earned around $10, often it is even just as low as $5. The reason Duty Money have set it so high is so that you’re forced to refer a whole bunch of people into their scam before you find out it’s fake. 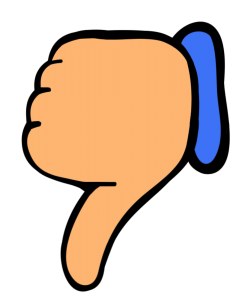 My Verdict – Is Duty Money a Scam? Yes it is, there’s no doubt about that & it’s a very dangerous scam indeed. Whilst obviously scams that part you with your cash are bad enough, this one is set out to take your details & part you with as much as they possibly can. Not only that but they will then try & use you to draw more people into it, including potentially your friends or family. Basically the whole thing is just set out to steal the usernames, emails & passwords of as many people as they possibly can. Then from there they will try to login to any accounts associated with the details such as Amazon accounts, PayPal accounts… Anything through which they can get money or products. These types of scams have even been known to log into people’s social media accounts & then screenshot private messages requesting money from the owners of the accounts to prevent them from publishing the screenshots… Very bad indeed. So overall it’s safe to say that I certainly won’t be recommending this site to you, in fact I’ll be doing the complete opposite & advising that you go out of your way to avoid it. I’d also recommend you sharing this post with your friends too so that they don’t end up falling for it. Anyway if you happen to have any further comments or questions about it don’t hesitate to leave them below, and also if you have already signed up to it before reading this review then make sure you change your passwords if you use the same one elsewhere. CryptoWorld Network Review – Scam or Legit Cryptocurrency Networking Site?